What is the best cultivar for growing organic oats? Are exclusion nets effective in protecting apples from pests? Can we boost disease resilience in strawberries by using with silicon? Are there effective alternatives for treating and preventing mastitis? What is the primary barrier faced by organic processors? 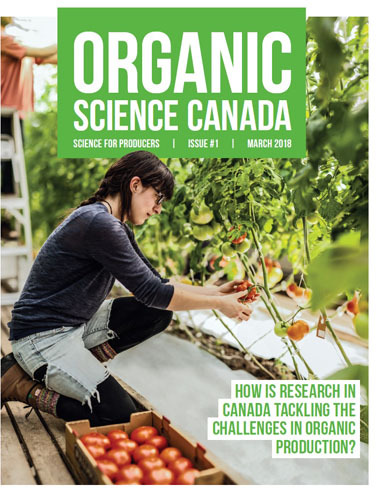 The Organic Federation of Canada and the Organic Agriculture Center of Canada at Dalhousie University are happy to present Organic Science Canada, a magazine that describes in everyday language the 37 research activities performed under the Organic Science Cluster II. Each activity is summarized with the background, methodology and results on one page. You will learn about pest management in grain storage, effective sanitation for organic sprouts, and the best use of green manures in organic grain production, as well as other interesting issues in organic production systems. Click the link below to read the ‘easy science for organic producers’ magazine. We hope that it will inspire and encourage you to partner with research! A series of Question & Answer style articles with lead researchers of Organic Science Cluster II. These articles capture conversations with the researchers about themselves, their research, and the potential impacts of their work. These articles are collaborative initiatives of the Organic Agriculture Centre of Canada at Dalhousie University and the Organic Federation of Canada. A series of articles with Organic Science Cluster II partners. These articles capture conversations with partners about their organizations, their support of OSCII research, and the potential impacts of the work that they are supporting. These articles are collaborative initiatives of the Organic Agriculture Centre of Canada at Dalhousie University and the Organic Federation of Canada. As Organic Science Cluster II (OSCII) completes the third year of activities, the Organic Federation of Canada and OACC have created a series of eight short films that present organic producers engaged in research and innovation in close cooperation with OSCII researchers. These videos illustrate the important cooperation between researchers and producers in advancing the science of organic production to benefit organic yields and quality. Poster at the 2015 Guelph Organic Conference.